The Badham Building Slate Roof Repair - Slate Roofing Australia. Slate Roofing Australia was contracted for the Badham Building slate roof repair using the Welsh Penrhyn slate. The Badham Building was built in 1888 and substantially remodelled in the mid-1920s. Additional storeys and a terracotta roof were added, with a boarded soffit and copper gutter. 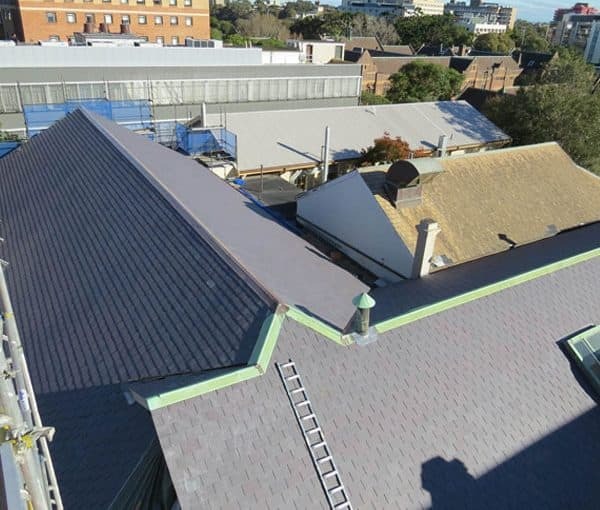 Slate Roofing Australia replaced the historic building’s roof with Welsh Penrhyn slate in 2014. Heritage listed Badham Building at the University of Sydney Built in 1887-1888 North and west facades and tower are Professor Wilkinson’s interpretation of Italianate finished in creamy stucco. The Physics Laboratory was a single storey rendered masonry building with a slate roof. The building was substantially remodeled in the mid-1920’s by Leslie Wilkinson. The Italianate style tower of the original Physics Laboratory was retained. Additional storeys were added with the original cornice forming a string-course at first-floor sill height. A terracotta roof was added, with a boarded soffit and copper gutter. The Badham building, including the earlier sections, was finished in a cream stucco.